talkhealth > Blog > 2013/05 > Menopause and Spilled Milk! As a writer, revision is my middle name. I revise, almost, until the cows come home. But what about as a menopausal woman? Do I need to turn myself into ice cream? Or should I just be happy with spilled milk, no crying allowed? Cliff, my husband the engineer, goes into semi-heart failure if he spills anything. A splash of pickle juice. A dollop of coffee grounds. The cries from the kitchen make me think the stove has caught fire, again, or the refrigerator is emitting poisonous gas. To me, a spill isn’t such a big deal, unless it ruins a silk blouse or my daughter’s hard-earned diploma. And so perhaps it should be with our bodies. Our houses. Our goals. Our disappointments. Maybe we simply need to chill and embrace the spill. I’ve thought the same thing about me. Did The Great Pause put you into more accepting pastures? Are you learning to embrace the spill? 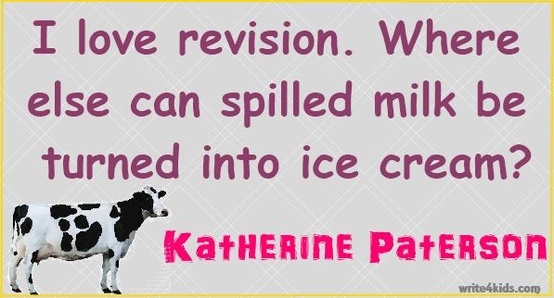 Photo: Thanks to Write4Kids.com for the Katherine Paterson quote. Katherine Paterson is the author of over thirty books including the much beloved Bridge to Terabithia. Read more about her writing process in this interview posted on the Scholastic Books website. My story “Christabel and Mr. Reader,” inspired by my reading husband Cliff, was a Finalist for the Katherine Paterson Prize. You can read the story here, on the website of Hunger Mountain: The VCFA Journal of the Arts.